Detroit is or was home to many people who went on to make it big. Some Detroiters found their fame on the big screen or behind it. Still, others found their fame in music or comedy. One Detroiter became famous for taking a stand on a controversial issue: assisted suicide. Whether they are famous or infamous, these people help put Detroit on the map. Star of Home Improvement, a television comedy set in a Detroit suburb. Allen spent much of his childhood in Birmingham. He attended Western Michigan University and performed stand-up comedy at Mark Ridley's Comedy Castle in Detroit. Bruckheimer is a powerful Hollywood producer. In addition to producing movies like National Treasure, Pirates of the Caribbean and Pearl Harbor, Bruckheimer has produced several television shows. He was born in Detroit in 1945.
Cooper was born Vincent Damon Furnier in Detroit in 1948. Originally, Furnier's band was named Alice Cooper. After the band broke up, Furnier changed his name to Alice Cooper. He often returns to the Detroit area. Camp filmmaker in 1950s and 60s Hollywood, Corman was responsible for such classics as The Wasp Woman, The Brain Eaters and the original The Little Shop of Horrors. He is still going strong as a producer. He was born in Detroit in 1926. Star of Terms of Endearment, Dumb and Dumber, and The Squid and the Whale, Daniels was raised in Chelsea, Michigan. After making it big, Daniels opened the Purple Rose Theatre Company in Chelsea where his family still resides. He is married to his high school sweetheart. 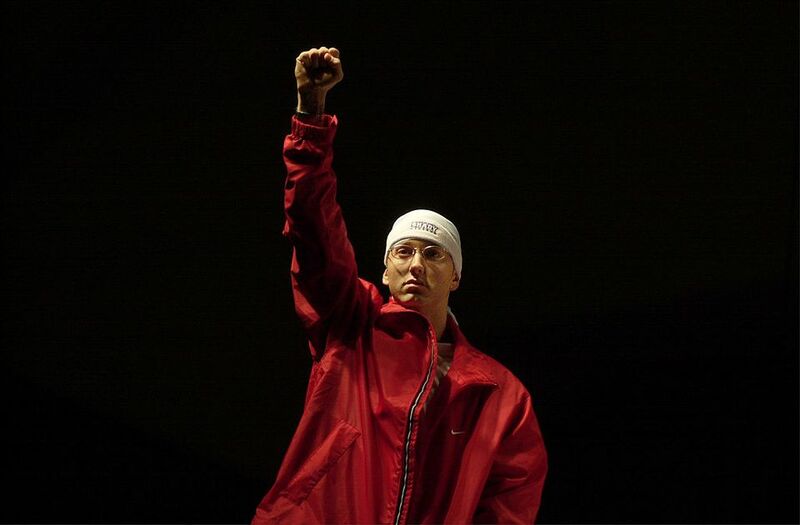 Eminem, rapper and star of 8 Mile, was born Marshall Bruce Mathers III and spent much of his childhood in the Metro Detroit Area, including Warren, Roseville and St. Clair Shores. He attended Lincoln High School in Warren. Creator and writer of the critically acclaimed Freaks & Geeks, Feig also acts and directs. He was born in Royal Oak in 1962, raised in Mt. Clemens and graduated from Chippewa Valley High School. Freaks & Geeks is loosely based on his high school experience and takes place in the fictional small town of "Chippewa." Hulce played Wolfgang Amadeus Mozart in Amadeus, voiced the title character in Disney's Hunchback of Notre Dam and played Pinto in Animal House. He was born in Detroit in 1953, grew up in Plymouth and worked at a small theater in Ann Arbor. Kid Rock first came on the music scene with his Grits Sandwiches for Breakfast album in 1990. These days he's cemented his success. Otherwise known as Robert James Ritchie, "Kid Rock" hails from an upper-class home in Romeo, Michigan. He remains very supportive of Detroit. Best known as one of the original "not ready for primetime players" on Saturday Night Live in the late 70s, Radner was born in Detroit in 1946 and attended the University of Michigan. Raimi directed the cult classic The Evil Dead, as well as the critically acclaimed Spiderman movies. He was born in Royal Oak in 1959. He hung out and made films with Bruce Campbell, whom he met in high school. He went to Michigan State University. Best known as likable detective Magnum P.I., and as the intense New York City police commissioner Frank Reagan in the hit TV series Blue Bloods, Selleck was born in Detroit in 1945. His Magnum character wore a Detroit Tigers hat throughout the series. Selleck has appeared in several popular westerns, including Quigley Down Under, the remake of Monte Walsh, and The Sacketts. Sizemore played lots of tough guys in the 1990s in hit films such as Heat, co-starring Robert DeNiro and Al Pacino. He also played Bat Masterson in Wyatt Earp, starring Kevin Costner. One of his best-known roles was in Saving Private Ryan. He was born in Detroit in 1961 and went to Wayne State University.